In honor of National Poetry Month, today we’re celebrating five of the many talented artists who’ve been honored for their achievements in both fields! Celebrated American poet, Maya Angelou, actually got her start as a singer, releasing a 1957 album entitled, Miss Calypso. Fifty years later, she combined creative forces with renowned jazz musician Wynton Marsalis for the piece, “Music, Deep Rivers in My Soul” (2007). In 1956, critically acclaimed singer/songwriter Leonard Cohen published his first book of poems, Let Us Compare Mythologies (McGill Poetry Series), as a 22-year-old. His well-received second volume of poems, The Spice Box of Earth, came out in 1961. He published over a dozen collections of poetry in his lifetime. Bob Dylan’s lyrics were officially welcomed into the canon of modern poetry with the Swedish Academy’s nonconventional selection of the singer-songwriter as the recipient of the 2016 Nobel Prize for Literature. In addition to his prolific songwriting career, Dylan also published a book of prose poems in 1971, entitled Tarantula. At the 2016 MTV Video Music Awards—which happened to coincide with the 53rd anniversary of Dr. Martin Luther King, Jr.’s “I Have a Dream” speech—R&B singer/songwriter/producer/pianist/actress Alicia Keys delivered a show-stopping poetry reading. Her chosen mode of self-expression reflected Ms. Keys’ long history with the art form. In 2004, she published her life’s poetic musings in Tears for Water: Songbook of Poems and Lyrics. As a seasoned songwriter, composer and singer, Jimmy Webb has frequently topped the chart with memorable songs like his 1968 ballad “MacArthur Park”—which he performed from the Levitt Pavilion Los Angeles stage in honor of the song’s 45th anniversary. Last year, Webb was honored with the 2016 Poet’s Award, from The Academy of Country Music. This year he’ll be featured in the “Poets and Prophets Series” at The Country Music Hall of Fame. 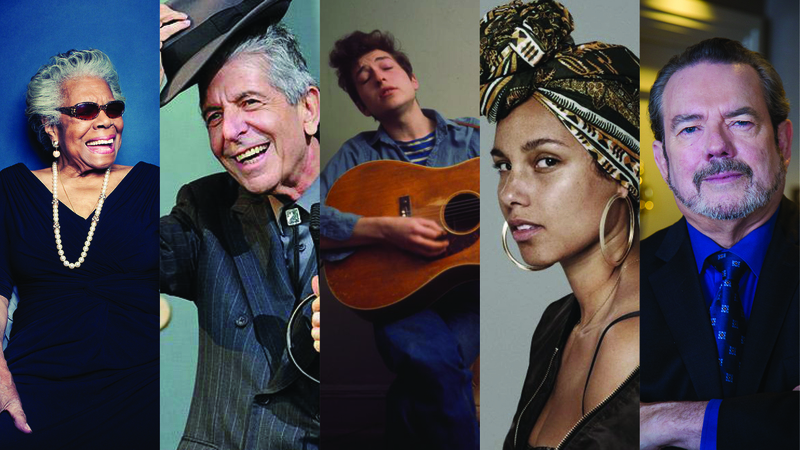 Don’t see your favorite musician-poet on our list? Share in the comments section below!